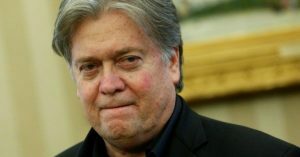 President Donald Trump signed memorandums on Saturday that kicked the nation’s top military and intelligence advisers off the National Security Council’s (NSC) Principals Committee and elevated his chief strategist, Steve Bannon, in their place. The memorandum gives Bannon, former executive chair of the rightwing website Breitbart News, a regular seat at some of the most sensitive meetings at the highest levels of government, along with other NSC meetings. The Director of National Intelligence (DNI) and the chairman of the Joint Chiefs of Staff—who need to be confirmed by the Senate—will now only attend the meetings when discussions pertain to their “responsibilities and expertise,” the memo states. Additionally, while Bannon has been granted this privileged access, CIA director Mike Pompeo has not—another break with tradition, Bellinger wrote. Both Bush and former President Barack Obama gave the DNI and the chairman of the Joint Chiefs of Staff regular seats on their councils. The NSC executive secretary (General Keith Kellogg) “shall” attend all Principals Committee and Deputies Committee meetings. This is also unusual. The executive secretary in the Bush administration was generally too busy and did not attend NSC or PC meetings. [….] The Deputies Committee will have at least 14 regularly invited participants and potentially 19 or more. This will be unwieldy. To reiterate, the Joint Chiefs of Staff have been removed from the National Security Council and replaced with a white nationalist. Worry. The memo was issued amid a second series of executive orders in Trump’s first full week in office, including ordering the Pentagon to devise a plan in 30 days to defeat the Islamic State (ISIS). The president also held several calls with foreign leaders, including Russian President Vladimir Putin, French President François Hollande, Japanese Prime Minister Shinzo Abe, German Chancellor Angela Merkel, and Australian Prime Minister Malcolm Turnbull. Bannon joined Trump for all of those calls.